False Flag Operation Detracts Criticism From The Wine Country Comic Con? Home » Comics » False Flag Operation Detracts Criticism From The Wine Country Comic Con? We’ve looked at concerns that a number of websites and individuals have had regarding the actions of the Wine Country Comic Con of Santa Rosa, California, and its organiser Uriel Bruna, with its inaugural show happening this month. They include the social media spamming by the creation of fake accounts, and charity claims that didn’t pan out as initially promised. Those looking for more might have come across the Facebook group Comic Con Controversy In Northern California. Could they have more information to expose? Nerd and TIe broke this story which has gone viral. This is their second podcast on thie subject. Trea Dorn, in our opinion, is a great news reporter. You should check out the Nerd and Tie Facebook page. Great articles and podcast!! What are your thought after watching this? What are your thought on this article? 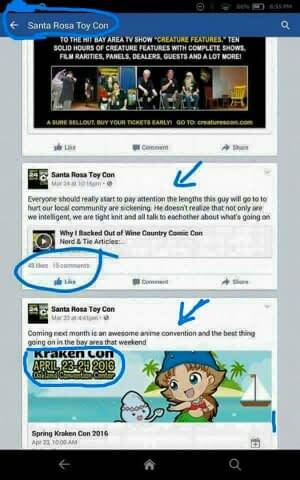 Is cyber bullying happening in the post and comments on Facebook about the Comic Con Controversy that can be found on the Santa Rosa Toy Con page. 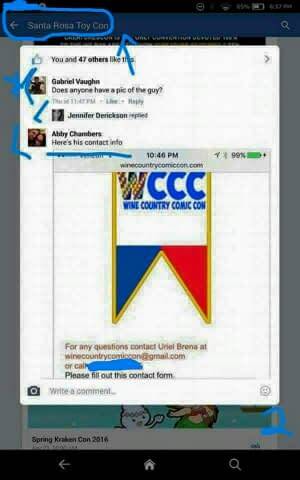 There is no reaction to the negative post on the Wine Country Comic Con’s FB page. The WCCC is not attacking the competition on their page, and there is A LOT that can be said about that Con and it’s promoter. So what is really going on? Because, despite linking to articles critical of the convention, there was another narrative here. One that sought to portray the negative articles about the Wine County Comic Con as the work of rival convention, the Santa Rosa Toy Con. Or if no one will believe that, that there’s blame to go round all involved. Fact: 100 percent of the funds raised at the WCCC will go to The Lions Club building fund. The members have been working on their building fund project for over two decades. The members are mostly Senior Citizen volunteers, some do not own computers and the rest use computers for e-mailing or staying in touch with family and friends. To think that this wonderfully group of worldly and wise people could be conned by anyone is ridiculous and insulting .. widows and veterans, are being harassed online, over the phone and in person. They informed Mike Holbrook, Promoter of the SR Toy and Comic Con, Mike Holbrook of their involvement months ago so he is aware of the truth yet still persist in attempting to derail the WCCC and uses the Toy and Comic Con Facebook page as a tool to manipulate and control the Mob he has created to wage flame wars against the promoter of the WCCC. …there was still an attempt to be neutral, but trying to tar everyone with the same brush. Before showing off people attacking the Wine County Comic Con on social media after this information was exposed and painting it as bullying. PUBLIC SHAMING: There are four picture posted on our page. They show the public shaming of Uriel Brenner, the promoter of the Wine Country Comic Con. In the comments on a post on the Toy and Comic Con Page is a picture of Mr. Brenner in a comment and in another comment on the post someone shared his contact information. Mr. Brenner has been accused of a lot in this controversy and should be completely honest and answer all the questions out there to save his reputation. But does the punishment by public shaming suit the crimes he is accused of or does it far exceed them? After seeing these screen shots what is your opinion on this? The Roseland Lions Club, sponsors of Wine Country Comic Con, issues the following clarification and apology to the cosplay community regarding the first annual Wine Country Comic Con which is being held April 23 and 24, 2016 at the Sonoma County Fairgrounds. 1) Roseland Lions Club wishes to clarify that 100% of the net proceeds of Wine Country Comic Con will go to the Roseland Lions Club Building Fund. Roseland Lions Club is a 501(c)(3) nonprofit organization registered under the name Santa Rosa Roseland Lions & Lioness Lions Club. We apologize for any materials previously published on the Wine Country Comic Con website at http://www.winecountrycomiccon.com/ and Wine County Comic Con Facebook page athttp://www.facebook.com/WineCountryComicCon/, which either stated or implied that money raised from the convention would go to the Early Learning at Institute of Rohnert Park or to directly fund an early learning center for Autism Spectrum Disorder. Roseland Lions Club wishes to make it clear that proceeds from Wine Country Comic Con will go to construction of a building for the Roseland Lions Club. In the building there will be a Resource Center and a team chaired by Lion Uriel Brena to work on the creation of an early learning center for children with Autism Spectrum Disorder and children with speech and behavioral problems. 2) Roseland Lions Club wishes to clarify a previous press release which stated erroneously that Uriel Brena is a vice president of Roseland Lions Club. Uriel Brena is a member in good standing of Roseland Lions Club, but not a vice president. 3) Roseland Lions Club wishes to apologize for the unauthorized use of any proprietary or copyrighted images which may have been used to publicize Wine Country Comic Con. We have made an effort to remove all proprietary or copyrighted images from the website and Facebook page for the convention. Please advise us immediately if there are any more proprietary or copyrighted images being used without permission of the owners of such images, and we will remove them immediately. We sincerely hope that the above clarifications and apologies will help to heal any misunderstandings or hostilities which we may have garnered with the greater cosplay community. We sincerely hope that Wine Country Comic Con will make a positive contribution to the community. We wish to proceed with complete transparency and earn your good will. Well, this seems to be a Facebook page generated by the show, or someone heavily associated with it, with the intent of drawing in people looking for more juice and, anonymously, giving another side to the story. One that targets rival convention promoter and organiser Mike Holbrook as the instigator behind all the fuss, something the original exposing website Nerd & Tie deny. The cyberbulling articles that the site links to, are all articles that Jeff Sterck, son of Pat Sterck, has run on his own personal page in the last month as well as posting in support of the WCCC. He has also linked to the Controversy site, describing it as “this third page not associated to either promoter”. If nothing else, there appears to be a link between the page and, well, Jeff. This seems to be a way to attract people away from other sites to discuss issues about the show, while muddying the waters over who is to blame. And finding any way to taint the opposing show and clear the name of the Wine County Comic Con. Gamers Beware or beware of gamers! What are your thoughts on this article and it’s subject? Let us know in the comments. One of the Con promoters is connected to this controversy is a gamer and runs a comic shop with a gaming room, in Santa Rosa, CA where the Comic Convention controversy is taking place This article may describe where the Con Promoter’s head is at and if being a gamer gave him a mindset that led him to cyberbulling a rival promoter on his cons Facebook page. This is known as a false flag operation. The term describes covert operations that are designed to deceive in such a way that the operations appear as though they are being carried out by entities, groups, or nations other than those who actually planned and executed them. And often the obsession of conspiracy groups. But is this case is there any other explanation? Neither Jeff not the Controversy page responded to Bleeding Cool’s attempt to ask further questions today.